The school will only close as a last resort (on grounds of severe weather or for other serious reasons, such as a funeral). Consideration will always be given to the impact on the children’s education, as well as, to the effect on working parents and carers. The headteacher will decide whether or not to close the school, having due regard for the health and safety considerations, as well as implications for parents who may have to arrange childcare. In the event of snow and widespread school closures, BBC Essex and Heart FM will publish the name of CLOSED schools at bbc.co.uk/essex and www.heartessex.co.uk . BBC Essex and Heart FM will broadcast information about schools which are closed. Please check the school website for up to date information galleywood.essex.sch.uk . The school will send an email via Home Contact. 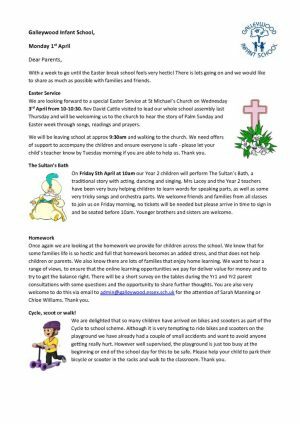 In the event of a planned closure (such as a funeral) the school will notify parents and carers via Home Contact and a letter, which will be given to each child. As much notice as possible will be given.